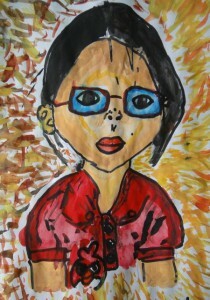 Last week, Diana painted this fantastic portrait of a classmate. Can you recognise a famous artist’s style here? It is an amazing idea for Diana to draw a portrait and it is a cool portrait! I like it a lot. I like the part that has more bright colors like yellow in the background and it reminds me of Van Gogh. It will be a lot more cool if she keeps drawing. I think it is amazing portrait and I like it, too! I’d never seen portrait like that before. Did you know one of my favorite artist is Van Gogh? This picture is awesome! I really like picture that Diana drew. The background is very nice and she painted a great portrait. Her drawing remainded me of famous artists called Renoir and Van Gogh. Those artists also drew very well. I think if she keeps drawing, Diana will be a famous artist also. I think that was great work. I didn’t see my friend draw so well like this! I will tell you how Diana did it. First she just tried to draw but then she used strategies to improve. (Strategy means a ways to get better) and she find a good strategy on the computer. There were picture and words that can help you draw. It’s good to improve. The picture is very good. I like this picture because the background color is bright and the picture is cool. This picture reminds me of the sun flowers that Van Gogh drew.